This is a sponsored post. Kewpie USA was kind enough to send me a box of mayonnaise and some salad dressings and this was one of the dishes that I’ve prepared with their products. 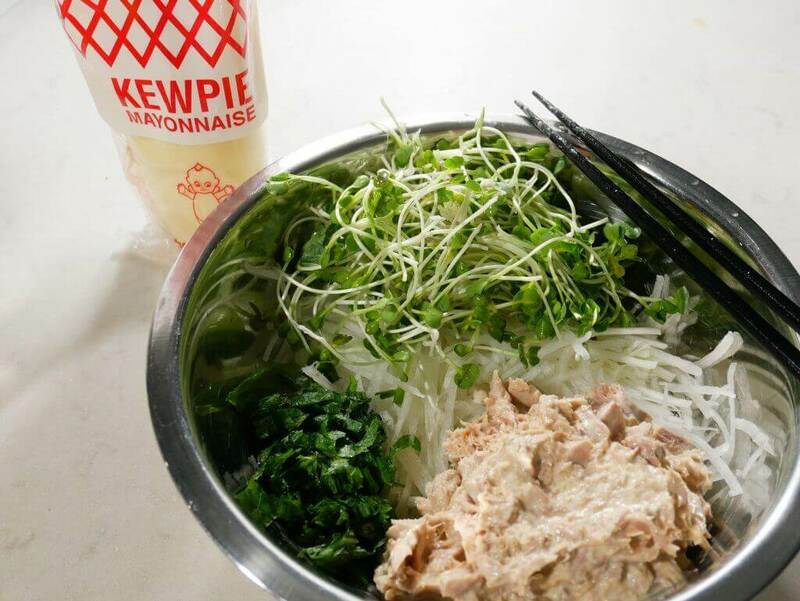 If you haven’t heard of Kewpie before, it’s well known for it’s mayonnaise, which is richer and creamier than it’s American counterparts. They also make great salad dressings, one of my favorites being the sesame one. Give them a try if you want to add some Japanese flavor to your food! Japanese radish is called ‘daikon’ (大根) in Japanese and it’s one of my favorite vegetables. It tastes quite similar to the little red radishes commonly seen in the US. If you haven’t heard of daikon is used in all kinds of dishes from appetizers to soups and main courses. Since it doesn’t have much flavor on it’s own, it’s very versatile and usually absorbs whatever flavor that it was surrounded with. 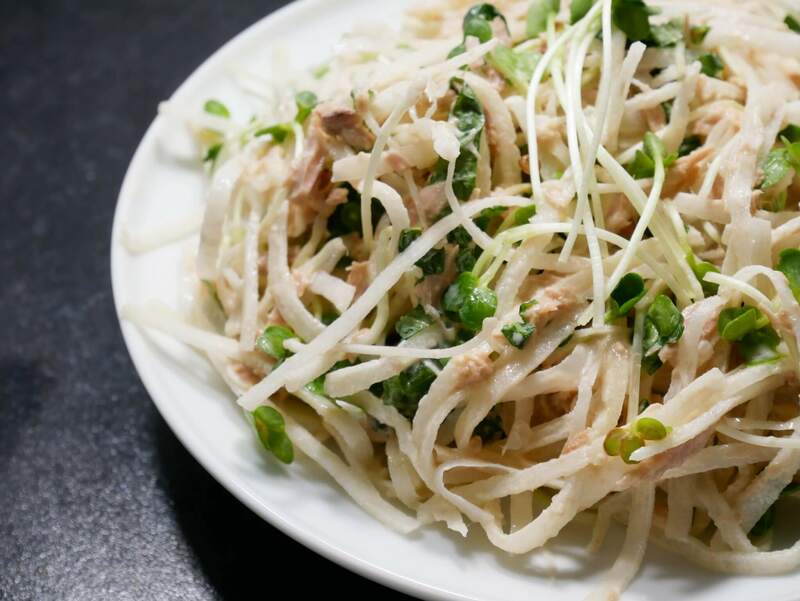 The sprouts of daikon are used in Japanese cuisine also. The sprouts are called ‘kaiware’ (カイワレ) and is commonly used as a garnish and things like temaki sushi (hand rolls). The sprouts taste like any other sprout of a vegetable – delicate with a little bit of nuttiness to them. Especially if you get some of the seeds. The seeds can get stuck in your teeth, so hold that smile after eating them!! Did you know the flavor of daikon can actually change from bitter to sweet depending on the season? It also can change depending on the way that you cut or grate it. *If you cut/grate lengthwise (along the fibers botttom to top), when the radish tends to be bitter, you can minimize the bitter flavors. I saw it on a Japanese TV show and tried it myself. The way that it works is that you keep more of the fibers that contain the bitter elements (isothiocyanates) intact and that’s what affects the flavor. Overall, I thought this was a really quick and healthy side to prepare. The hardest part about this dish is julienning the daikon. The best parts of this salad are it’s contrasting textures and flavors. It’s crunchy and has bite from the tuna. It also has fresh flavors from the shiso, subtle acidity from the vinegar, and subtle depth from the soy sauce, with noticeable nuttiness from the sprouts. I especially like to top it off with sesame oil and a bit of pepper for additional complexity. If you have spent konbu (e.g. you used it to make dashi broth), you can chop that up add that for additional umami flavor too. Let me know if you get a chance to try this and thanks for stopping by! First, wash and peel the daikon and then julienne into 3-4 inch strips. place into a bowl with enough cool water to just cover the radish while you prepare the rest of the ingredients. Next, cut the bottoms off the sprouts and rinse. Cut the shiso leaves into thin strips, 1/4 inch thick. Drain the water from the bowl with the julienned radish and lightly pat dry with a paper towel or two. Open the can of tuna, drain and add to the bowl with radishes. Measure and out your mayo, vinegar, sugar, and soy sauce and add to the same bowl and mix everything together. 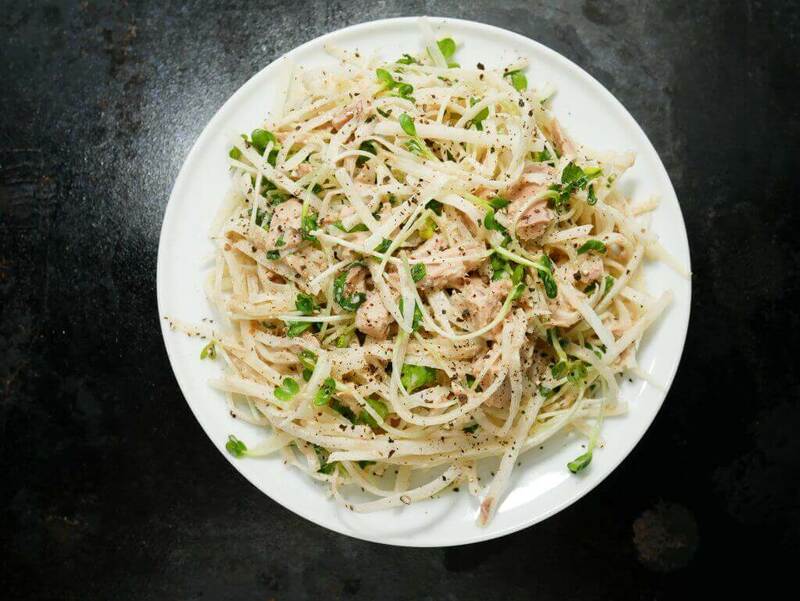 After you've mixed the tuna and seasonings in, add the sprouts, a spash of sesame oil, fresh pepper and serve! In case you missed them, here are some of my other Japanese recipes! I’ve tried a similar recipe to this one while I was in Japan and it left me speechless. I have to try your recipe, Patrick! This looks interesting. The other night I found one vegetable had gone bad, so I roasted a bag of radishes with olive oil. They were very good, kind of like summer squash. You might try it. Ive never heard of roasted radishes, that also sounds interesting!